Now, as we voyage through the tangled maze of brilliant nuggets, creative genius, and sheer madness that is the Arduin trilogy, we come upon the fabled Realm of the Charts, which has been uncharted until now. Get it? Damn, I’m clever. 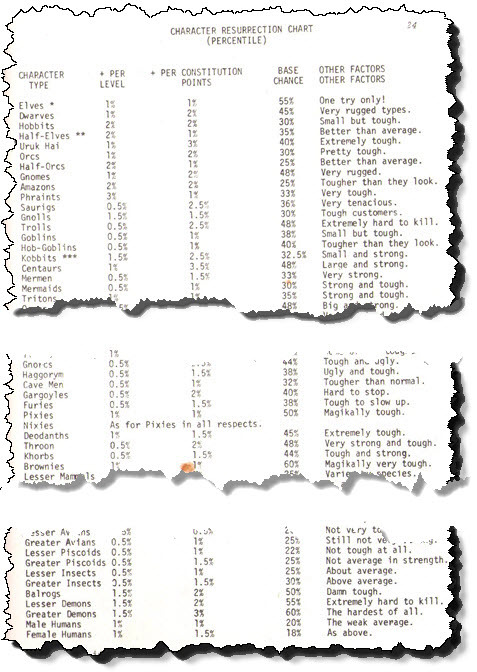 Anyway, there’s several pages of tables, charts, lists, indexes, notes, codicils, enumerations, and so on which are connected to each other in ways tenuous, obscure, and wholly non-existent. Yes, I used that joke here. This isn’t being lazy or repetitive, this is a deliberate callback, thus amplifying the humor through repetition, much like the Coyote being constantly hit by falling rocks. The “Mechanical Ability”, “Swimming Ability”, and “Stamina” columns from The Arduin Grimoire are gone here. Whether this is due to Dave Hargrave abandoning those mechanics, or this chart being vertical rather than horizontal, is a question for the ages. “Agility” remains referenced, though never quite explained, in Skull Tower, but “Stamina” less so. It may be that the split between manual “Dexterity” and full-body (I’m guessing) “Agility” was deemed more useful than whatever the division between Stamina and Constitution was supposed to model. I’ll keep an eye out for Stamina references going forward. 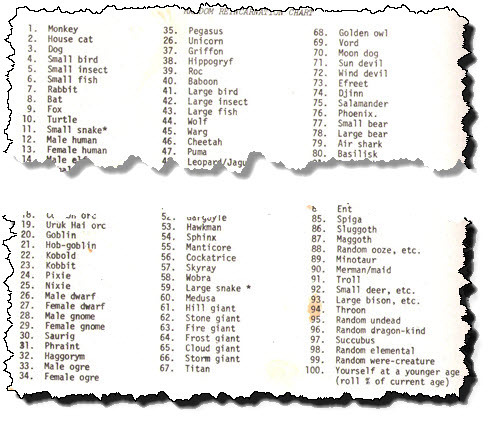 While the first limitation chart was mostly the more traditional races, with a few things like kobbits tossed in, this one really ups the ante in terms of variety: Hawkmen, Ocotorillas, Wargs, and so on. The “1” note informs us that more details are in the monster section; the “2” tells us the horse body is 1-3 points stronger than the “human” body, the “3” and “4” notes tell us that agility as listed is for swimming/flying, and is halved otherwise. Good lord, phraints have redonkulous dexterity. I’m guessing you had to roll a natural 17 or 18 to play one, which would have kept them damn rare, as they were supposed to be. I suspect 99% of all phraints were rolled up when the DM wasn’t looking. The mere existence of this chart demonstrates, to my mind, the foolishness of believing that “video game style respawning” is somehow a product of the accursed modern era, and back in Ye Olden Days (which I lived and gamed through, and which an awful lot of people with strong opinions about them didn’t), men were real men, women were real women, small furry creatures from Alpha Centauri were available as player characters, and there was no “revolving door afterlife”. The hell there wasn’t! That door spun so fast, Dave Hargrave needed a chart broken down into half percentages to figure out who could race back through it. Elvish females (per footnote, not shown) have a 2% lower chance of resurrection than Elvish males. Why? Who cares! It’s these sorts of random details that make exploring these books so much fun. As my caption snidely notes, virtually every species, except avians and piscoids (which doesn’t include merfolk or tritons), is “tougher than average”, “very tough”, “hard to kill”, and so on. Not that these “Other Factors” actually come into play in any way… the percentages tell the tale. Pixies are “magikally tough”, which sounds like you need to marinate them a long time before grilling. Brownies are “magikally very tough”, especially if they’re overcooked and dry. Top with vanilla ice cream to help counteract this. How often did one need to roll to resurrect a greater demon? Well, never mind “where”… how old are they? I’m assuming that “Experience Points” is how many the dragon needed to earn, and the fact Dave had rules for dragons earning XP tells you a lot about how awesome his games had to have been. Random Ooze? Sure, Why Not? Having looked at charts for coming back from the dead, we go on to charts about how you get dead in the first place. There’s an attack matrix for claws and other natural attacks — I’m not sure why it’s needed in addition to the standard charts. 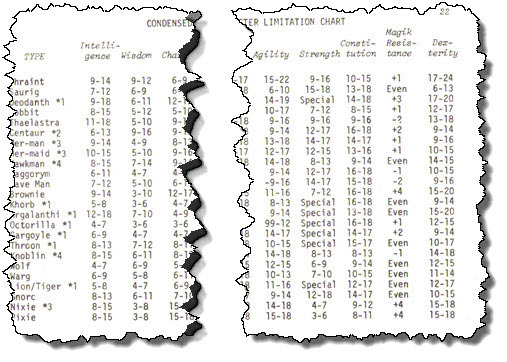 It’s mostly 1 better than the standard attack chart… e.g., if you need a 13 to hit a given AC on the chart in the Grimoire, you need a 12 here. OK. Moving on..
You’re Instantly Dead, And You Take 4d12 Damage! That’s more like it! You’ve got your death in 1-3 rounds, your instant death, and your instant and irrevocable death! No reincarnation chart for you! I have no idea why the chart include additional damage for “instant death” results. In some modern incarnations of D&D, exactly just how far you are below 0 Hit Points does matter — some abilities in Pathfinder, for instance, can heal the just-dead by a random amount, which may or may not be enough to get them up to “mostly dead”. But old-school D&D? Not so much, unless this is a glimpse into some lost mechanics of Dave’s. I totally love the “roll for % of arm lost” kind of mechanics, and the potential arguments over what you could do with 43% of an arm vs. 81% of one. The next page is interesting. 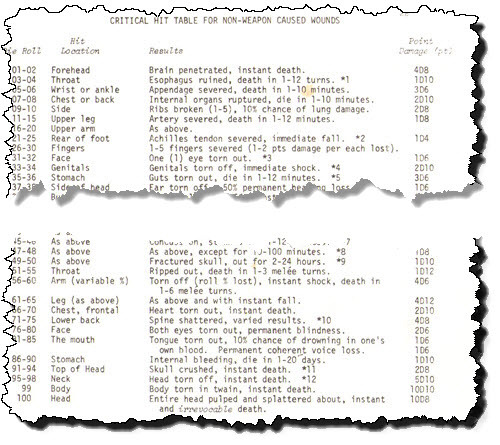 It’s a collection of rules, notes, and modifications for the effects of injury, and is credited to “Doctor William Voorhees, a specialist in internal medicine”, who “has a remarkable insight into rationalizing game magik and medical facts”. This Has Nothing To Do With Heavy Artillery. It Was Just There. 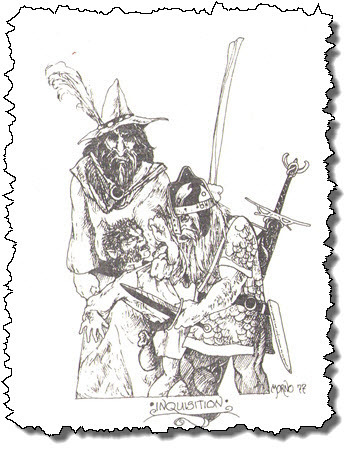 But first, here’s a picture of a dwarf and a wizard torturing what I suspect is a kobbit — a kobold/hobbit crossbreed. Or it might just be a particularly scruffy hobbit — who knows? Maybe it’s a hobbit slaver, and totally deserves it. The next two pages have a surprising amount of white space for the Arduin books, and contain three tables of damage, ranges, and so forth for all kind and manner of small and large caliber weaponry, from 20mm to 16 inches. The system involves “ACP”, or “Armor Class Penetration”, and there’s various damage factors for different levels of armor penetrated, and so on. Or, IOW, it’s another micromechanic that uses different rules than, say, crossbow bolts or other ranged weapons. It’s perfectly understandable why it was done this way, and I’m guessing it had a lot to do with either Dave, or someone in Dave’s group, being familiar with either real-world artillery or wargaming mechanics for such things, or both, and bringing that knowledge into D&D. A lot of Burgess Shale Era fan/semi-pro gaming material was clearly someone taking their personal expertise in an area and translating it into D&D terms, preferring to create their own mechanics to model it rather than trying to use the limited toolbox of existing systems. It is noted that concussion effects can include hearing loss, internal hemorrhaging, blindness, or being set afire, “the frequency of which is up to the DM”. Likewise, blast effects can travel long distances in “confined areas” such as dungeon corridors. Heh heh heh…. Compounded Monthly With An Adjusted Rate Of 0.25% But Not More Than 1% per Year…. So, yeah, there’s that. Let me note that the idea of giving “monsters” magic weapons and armor (and other gear) is yet another concept that didn’t become standard in D&D until 3.x (and was mostly dropped in 4 and 5, though it lives on quite nicely in Pathfinder). I will also point out that a fairly important rule, the 10%/level reduction, is buried in the example text. This was also somewhat typical of the era. You had to read carefully to find all the hidden bits; they weren’t always called out for you. Well, that’s 12 pages covered — probably the most any of these has ever done in one go! Next time, usurious loan rates, magic weapons by the plus, and more! But when will we learn what “competent” means from back in Part V of the Grimoire? If the example encounter was typical of Dave’s games (a magically armored, vorpal armed medusa against a four-man party), I’d be surprised at anyone making it to 50th level…though I suppose a PC didn’t lose CON points for resurrection back in the pre-AD&D days. I did laugh at the 225xp for such an encounter (split four ways! ), but I’m sure the treasure take would make up the difference. There are quite a few examples of NPC monsters using magic weapons and armor in the 1st and 2nd edition (AD&D) adventure modules (they are, of course, littered through Gygax’s D-series, but I distinctly recall ogres in +5 chain mail as a regular encounter in Return to White Plume Mountain).